Presenting the rose flower knobs to give a decorative and functional use to the furniture drawer, cabinets or wardrobes .The design of the knob is a classic as the knob itself has a very beautiful and romantic feel to it. Care has been taken to give the actual shape of the rose so that it looks real and gives the decorative and spring feel to the home furniture. The colour of the rose is normally red but here there is a slight twist given to the colour of the knob to make it match the furnishings and upholstery so that it creates a perfect balance in the interiors and goes with the line of colour an important aesthetic of interiors. 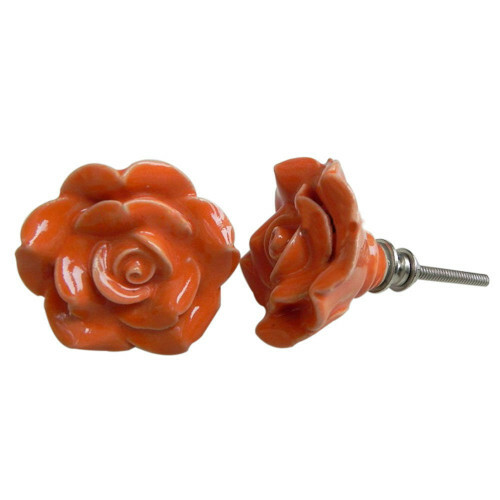 The rose knob can add beauty and glamour the furniture and it can also act as a replacement for old worn out and shabby looking hardware that is normally made of alluvium or iron. These outdated hardware rust and eventually break leaving a dark tan on the furniture surface which is known as a stain. There is no freshness to the look of the furniture so even though the furniture might be expensive it will not look as impressive as it should look .The beauty of the orange knob that it has the ability to transform ordinary looking furniture into a spectacular looking furniture piece. It shows as designer look to the furniture thereby improving the look of the piece. With 2″ diameter with 1.50″ projection approximately with 1.80″ Bolt that can be trimmed to size of the thickness of the furniture. The knob is firstly made in its natural colour that is cream and then it is dipped in the orange colour that is prepared using red and yellow colour .The colour chosen is made of natural vegetable dye and hence it non toxic and can be safely used in the kids room or in the kitchen drawer, cabinets or the sideboards. The knobs are also an ideal gifting option to friends and relatives in the functions related to renovation and makeover. The best part is that it comes along with its own attachments and you can fix it yourself.